Science fiction and modern art were born together in the Romantic imagination of the early 19th century. Mary Shelley’s Frankenstein: or a Modern Prometheus, often credited as the first modern science fiction novel, was published the same year that Capsar David Freidrich painted Wanderer above the Sea of Fog in 1818. The role of the artist suggested by Freidrich’s painting is indivisible from its subject – a figure literally above the clouds, a metaphysical being transcendent over nature itself. In Shelley’s novel, Victor Frankenstein, a scientist obsessed with creating a simulacra of nature, has both the manner and aspiration of the Romantic artist. Contemporary art and science fiction continue to explore linked and complimentary subjects, echoing within their form, and in their narratives, a surprising continuity of effect. Despite their shared heritage, SF and contemporary art are often considered as separate, only occasionally meeting in the hyper-commercialised zones of Hollywood cinema, video games and book cover illustrations. But given the number of contemporary artists who drawn to SF for its themes, ideas and concepts, counter the popular misconception of their supposed estrangement. SF and contemporary art share more than a heritage – they are profoundly connected, and not just in the way they express related ideas, but in the manner in which they do so. Conquest of Space: Science Fiction & Contemporary Art charts the relationships between these two major genres of cultural expression, and it is built around three major themes of SF and contemporary art: the sublime, the uncanny, and the exploration of time and space. The exhibition places historical works by Australian artists alongside the work of contemporary practitioners to suggest that the roots of these ideas stretch back centuries. But before we discuss these themes and ideas– and the connections between them and individual works – let’s consider two vital concepts in the critical theory of science fiction -concepts equally useful in an understanding contemporary art. These concepts describe both the operation of SF, and how it is understood: the novum is literally the new thing, a narrative device that allows the story itself to take place. It can be both an object, and a theme – a time machine or a spaceship, a future society or an alternative present. The effect of SF, that sense of alienation we experience from its world yet feeling an attraction to its exotic differences, is termed cognitive estrangement. The narrative worlds of SF alienate the reader or viewer, a process that is “distinctive in creating and understanding the imagined world as different from our own…” . The novum works as the engine of the experience of cognitive estrangement. Darko Suvin, who theorised these related concepts in Metamorphoses of Science Fiction: On the Poetics and History of a Literary Genre  remarked that “…all the epistemological, ideological, and narrative implications and correlatives of the novum lead to the conclusion that significant SF is in fact a specifically roundabout way of commenting on an author’s collective context” . Suvin’s reading of SF as a text not concerned so much with the future or speculations on the development of technology, but as a meditation on the present seen through the lens of history, suggests in turn that contemporary art is closely related to SF both in terms of its form, but also in its sense of a collective context. Contemporary art as a genre is typically technological in nature, incorporating photography, video and new media, alongside more traditional forms such as painting, sculpture and drawing, all the while maintaining a critical attitude to its place in society and a utopian ambition to affect the future itself. Resonances of an early form of the science fictional imagination can be found in Romantic paintings such as Eugene von Guérard’s A Fig Tree on American Creek Near Wollongong NSW (1861). Although nominally of an actual location, the artist’s combination of symbolic elements layered into the scene – the scale of the tree itself, the density of the subtropical jungle, an arch created by a second fallen tree, and the tiny figure of a man at the left of the giant trunk, are reminiscent of other landscape paintings of the period, particularly of the American school of sublime painting that attempted to imbue within nature the solemnity of ancient ruins. John Glover’s Launceston and the river Tamar (1832) similarly presents nature as a kind of theatre for the entrainment of ladies and gentlemen, the exoticism of the environment rendered in picturesque terms. Nicholas Chevalier’s Pulpit Rock, Cape Schanck, Victoria  and von Guérard’s Figures on A Cliff [undated] – two remarkably similar images – attest to both the generic nature of the subject matter and to the constancy of the sublime as a series of pictorial formula. The sublime remains a major theme of contemporary science fiction – from the disaster and apocalyptic narratives of recent SF movies to the galaxy-spanning scales of the new space opera – and it is a major theme in recent contemporary art. Shoufay Derz’s Negatives 1 & 2  colour casts in black and orange a landscape of eternally shifting sands and distant mountains as something eerily alien, but is in fact a desert in China. So too Giles Alexander’s Our Father Is A Red Giant , Megan Jenkinson’s Atmospheric Optics X  and Tony Lloyd’s Field Delay  situate the classical subjects of the sublime – ocean storms, mountain tops, the sky at night – within the observational detachment of modern science. John A Douglas’s Body Fluid: Ascent  links the sublime landscape with the figure of the alien, a figure in a gold body suit, part interstellar traveller, part ascending Buddha. Kate Shaw’s Spegil  explores the limits of painterly representation of the landscape yet even in its abstracted form it invokes the classical themes of Romanticism. Lionel Bawden’s Monsters [Spirit of the Beehive] (2004), inspired by the alien life in Stanislaw Lem’s novel Solaris, posits a similarly abstracted, undulating form somewhere between living entity and eternally frozen seascape. Joel Rea’s Edge of the World  playfully places the startling image of a collapsing mountain into the superhero genre, a hooded figure of suburbia apparently causing the event, while Rick Amor’s contemplative and mysterious Journey  recalls the otherworldliness of Arnold Böklin’s Isle of the Dead , an example of a literally rendered yet symbolic alien world. The alien in science fiction embodies a number of pre-modern archetypes, while the robot or genetically altered or created being recasts those ancient fears as technological objects within a dialogue between nature and anti-nature. Through these avatars the uncanny and the grotesque remain as powerful now as they did for our ancestors. James Gleeson’s Across The Threshold  and Orion Becomes a Constellation  are conventionally considered to be Surrealist pictures, but in a literal sense they depict journeys into unknown worlds and across thresholds where physical form is left behind for the immaterial fields of pure colour. Laith McGregor’s Drifter  echoes Gleeson’s earlier narratives of transformation and finds a similar liberation in the painterly surface. In part inspired by J.G. Ballard’s Crystal World and its story of a jungle altered to crystalline form, McGregor’s painting might serve as a setting for the discovery of the hybrid creatures found in Shalini Jardin’s series The Span , a sequence of watercolours that imagine the outcome of splicing human and animal genes. Madeleine Kelly’s Split Unity  and Pitting Against The Core of Me  echo the insistent magic of Gleeson’s work but here Kelly finds the uncanny in the unfolding of mirrored images. Lionel Bawden’s series La Void  casts the landscape itself as a psychic manifestation – each canvas offering a glimpse of a portal that will take us beyond space and time. While Phil James’s paintings refer to the classic SF images of popular culture new and old, paintings such as Dream of Electric Sheep [Robot Chick] (2014) also have a palpable sense of the uncanny, a disturbing revelation beneath a jokey exterior. There is something of this sense of disturbance in Sam Leach’s Cinder with Partial Dymaxion , its baleful chimpanzee asleep amid an artificial, abstract field. In Hayden Fowler’s video Hunger  four white lambs jostle for a teat on a cold marble wall, while on another screen milk drips to the floor. In both Leach and Fowler’s works the troubled relationships between human society and nature are put into sharp contrast, a counter to the classically utopian impulses of SF for the dystopian reality of the world, prime examples of Suvin’s argument for an imaginative reconfiguring of the current context. The exploration of time and space is a concept that concerns both science fiction and art. The deployment of geometric forms in minimalist sculpture, a suggestion of time through repetition, was echoed in Stanley Kubrick’s 2001: A Space Odyssey  and its now iconic black monolith. 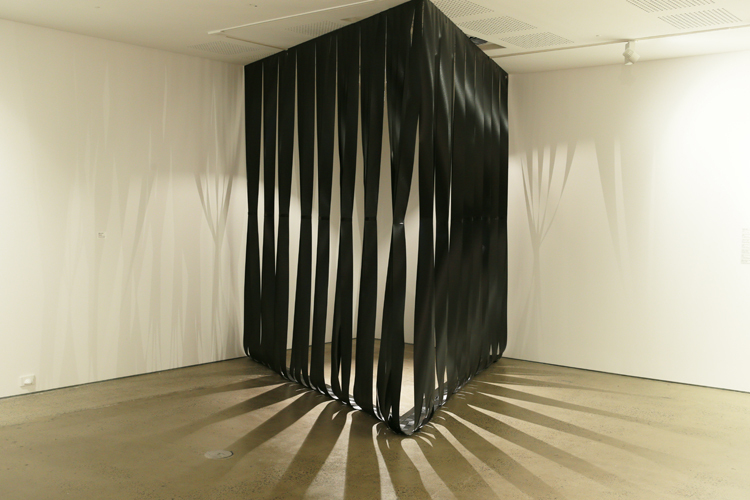 Biljana Jancic’s Bow (2014), a black wedge that protrudes from the gallery wall, evokes various temporal states in the radically reduced form of the sculpture itself, but also within the encoded time of the videotape used as its main material. This kind of abstraction underlies the meeting of images of the universe, of microscopic pictures and the printed knitting patterns used in Sandra Selig’s collage series Folded Worlds and Interleaves . Michaela Gleave’s Model for the End of The Universe  maps concepts for the shape and disposition of matter in the universe while Robert Klippel’s Drawings [1949-50] which, although preparatory studies for sculptures, point to a conceptual space as infinite as the star fields within Kubrick’s monolith. It was William Burroughs who famously claimed, “when you cut into the present the future leaks out,”  suggesting that the manipulation of media disrupts the fabric of space-time. Tristan Jalleh’s video Stadium Interstructure  stitches together stills into a tilt down into a seemingly bottomless chasm, yet it is a provisional space is conjured entirely by artificial means. Sam Smith’s video Into The Void  playfully conjoins video space with the void of Yves Klein’s immaterial blue creating a doorway between the present moment of the video and the eternal, floating pause of Klein’s famous leap into space. Ms&Mr’s Videodromes for the Alone: Amputee of the Neurotic Future 1988/2012 melds footage from the artists personal archive with images quoting the cover art of editions of J.G Ballard’s Crash, a narrative that proposes the freeway as viable an avenue for space travel as the light years between stars. These video works are the most explicit engagement with the idea of ‘media as time machine’ but the frozen moments of painting and sculpture can play with similar ideas. Ballardian space infuses Jeffrey Smart’s Bus Terminus , a painting of coloured guidelines on tarmac with a glimpse of the vehicles beyond, quotidian in their familiarity yet signifiers of a cryptic guidance system, while Callum Morton’s Screen #4 Chargrilled  stands as a scale model of a roadside apocalypse. Adam Norton’s Last Man on Earth  and Conquest of Space  pay tribute to classic SF movies and novels in their appropriation of the graphic styles of book covers and film posters from the mid-20th century, but also hint at their own conceptual worlds – a conquest of space itself. Where SF movies and novels posit the novum as a part of their narratives, contemporary artists offer the tight focus of their interpretations of our collective context as the engine of their works. We enter into the world of the art object as surely as we enter the SF story, and with the success of that vision, we have an experience remarkably consistent with the one described in the theory of cognitive estrangement. As we can see from the works in this exhibition, SF is not limited to the page or the screen, nor is it circumscribed by the limits of recognisable genre. In essence, contemporary art is science fiction. Suvin, quoted in Broderick, ibid. William Burroughs, “On The Origin and Theory of Tape Cut Ups”, Breakthrough In Grey Room, Sub Rosa, SUB 33005-8, 1986. Published in the catalogue for Conquest of Space: Science Fiction & Contemporary Art, Curated by Andrew Frost, UNSW Galleries, May 22 – July 5, 2014.